Women are a powerful and large market segment for sporting goods and sports apparel companies. Marketing to the female demographic requires companies to rethink their marketing mix – starting with the products. And don’t just color the products “pink” as that type of approach just irritates female shoppers! Female athletes are in search of products that are specifically developed to meet their unique needs for exercise. Although the female segment comprises only 10% of Oakley’s overall sales, more than 65% of women in the U.S. say that exercise and fitness are important parts of their lifestyle. Fitness apparel and accessories is a $14 billion industry and is growing twice as fast as general fashion retail. If companies want a share of the growing market, then their products need to be designed specifically for female athletes – and NOT colored pink. 1. Discuss the differences in marketing sports apparel and equipment to men and women. 2. Have students list what they believe are the top 10 factors for each gender when purchasing sports apparel. http://youtu.be/VbZBoFtEQkohttp://youtu.be/0y0nKPkYD7E4. Discuss the change in the campaign. What are the key messages? What was changed in the marketing mix relative to the products? 5. 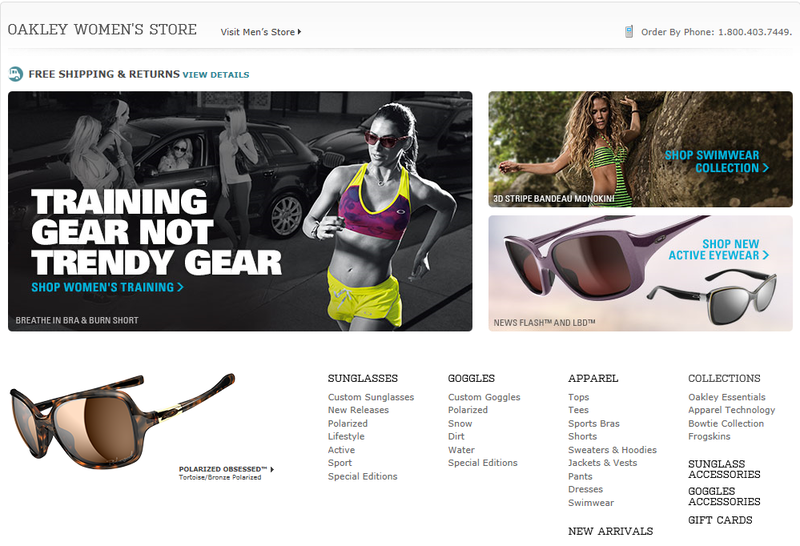 Bring up Oakley’s Web site for women: http://www.oakley.com/women/store6 How does this compare to the company’s Web site for men? http://www.oakley.com/store. 7. Have students examine female sports apparel from other companies such as Nike, Puma, Adidas, and others. 8. Finally, divide students into teams. Have each team develop a product and a marketing campaign for female athletes.